Perth : The team india celebrates the festival of color Holi with victory on West Indies by 4 wicket in their World Cup Pool B match at the WACA in Perth on Friday. With this victory, India booked their quarterfinal berth in the World Cup, as Mohammed Shami was chosen the Man of the match for taking three wickets in his eight overs. Dhoni, who arrived at the crease when India were in a spot of bother at 78/4, curbed his natural instincts and steadied the Indian innings taking calculated singles, while hitting a six and three fours in his 45-run knock that came off 56 balls. India's run chase got off to a poor start as they lost Shikhar Dhawan in the fifth over edging a Jerome Taylor delivery to second slip for Darren Sammy to take the catch. Taylor then dismissed Rohit Sharma in his next over having him caught behind by Denesh Ramdin. Virat Kohli hit five fours in his 36-ball 33 before he mistimed an Andre Russell delivery to deep square leg for Marlon Samuels to take the catch. India lost their fourth wicket when Ajinkya Rahane edged a Kemar Roach delivery to keeper Ramdin. On field umpire Nigel Llong adjudged Rahane out who promptly asked for a review and even though snickometer showed no edge, Rahane was adjudged out. Suresh Raina, his weakness against short-pitched deliveries well known, was welcomed with a barrage of bouncers. 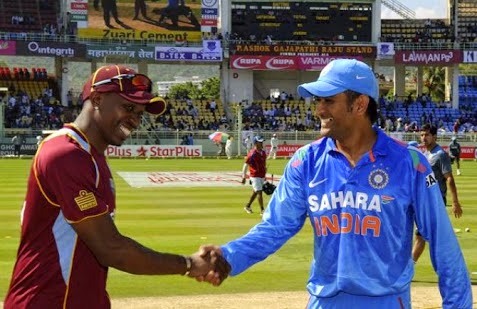 Raina stood up to the challenge hitting two good fours, before Dwayne Smith had him caught behind by Ramdin. Russell took his second wicket when he had Ravindra Jadeja caught by Samuels at deep square leg to be reduced to 134/6 in 29.3 overs.